Writing here is sometimes like standing in the middle of a crowded auditorium, peeling off layer after layer of clothing, asking, Do you like me yet? How about now? Or now? 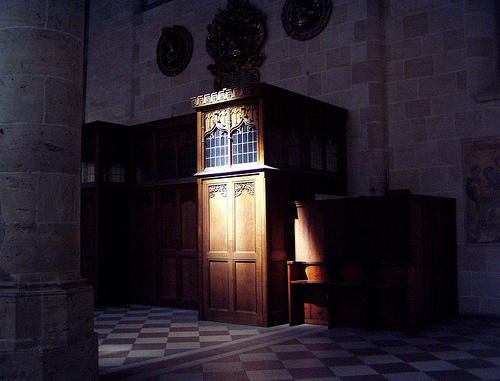 It’s sitting in a confessional and whispering my secrets into the gloom, inhaling the church fug of old incense, furniture polish and a thousand rainy days and exhaling all of my sins. It’s feeling like a grubby-faced kid writing a note to their crush, trying desperately to play it cool but ending up with a barely articulate mess of feelings. It’s sometimes like being pregnant and giving birth to a kitten, while all along I thought I was carrying a baby. And it’s not that I don’t like, maybe even love, the kitten, it’s just not what I set out to make in the first place. It’s slogging through the morass of possible words, digging in the muck to find the perfect turn of phrase. It’s realizing that nothing I write will ever be perfect, no matter how obsessively I revise and revise and then revise some more. It’s hearing Audra say, Perfect is the enemy of good. It’s wondering if anything I write will ever be good, or even good enough. My friend Meredith posted this poem on Facebook and it’s so exactly right. Every word is like a knife straight through me. I’m sitting in the middle of our community arts and culture centre, waiting for Emma to finish her class, crying. Yeah, that poem’s a killer. The warning should be at the beginning, and not the end. It wasn’t the poem at all. I’m TERRIBLE with poetry; I skipped the poem (sorry!). It’s YOUR writing that got me. The visual of removing your clothing was powerful. I’ve been feeling like an emotional wreck lately. Moreso than usual. I think it’s partly the blog. What you said about checking your inbox until something lovely comes in. And sometimes it just doesn’t. Oh, *hugs*. I’m so sorry you’ve been in a tough place lately (and that I’ve been so remiss in responding to comments).